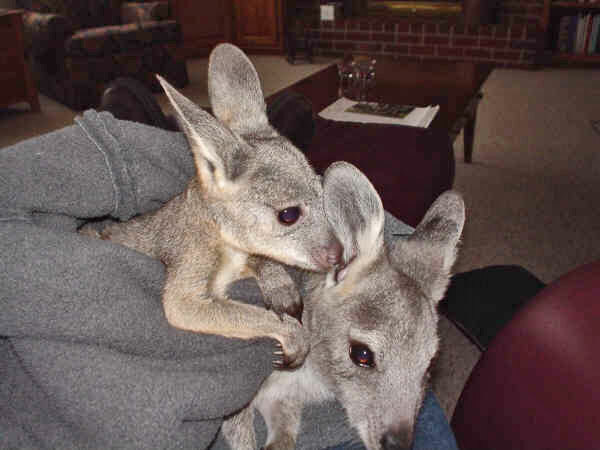 Check out the sweet and cuddly wallaroos bred and sold by Schreiner Farms for 17 years. 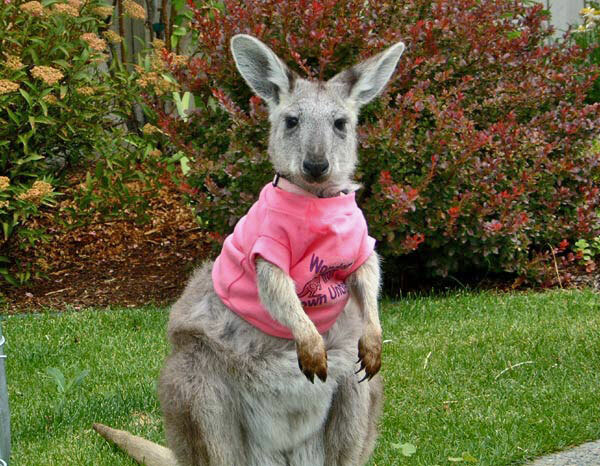 A Wallaroo is any of three closely related species of moderately large macropod, intermediate in size between the kangaroos and the wallabies. 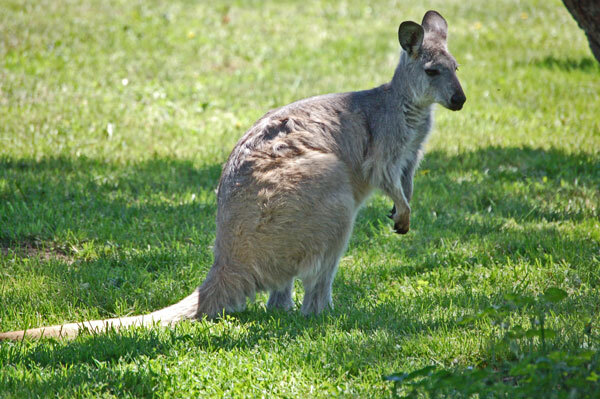 The name "Wallaroo" comes from the Eora Aboriginal tribe who were the original inhabitants of the Sydney area in Australia. 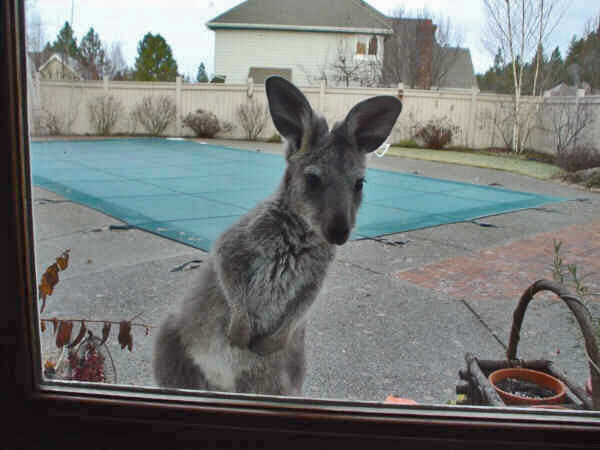 In general, a large, slim-bodied macropod of the open plains is called a "kangaroo"; a small to medium-sized one, particularly if it is relatively thickset, is a "wallaby": most wallaroos are only a little smaller than a kangaroo, thickset and are found in open country. All share a particular habit of stance: wrists raised, elbows tucked close into the body, and shoulders thrown back and all have a large, black-skinned area of hairless skin surrounding the nostrils. 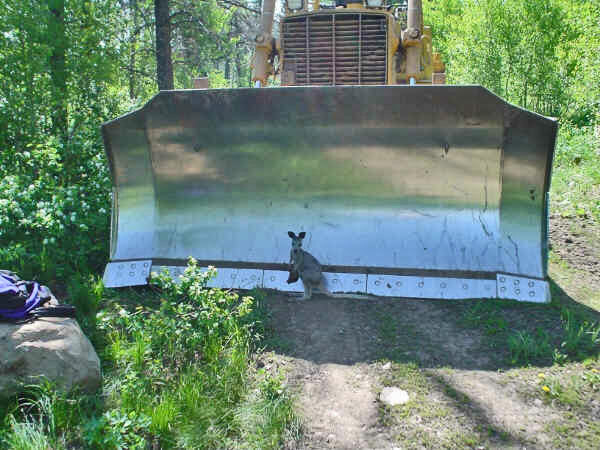 The best-known species is the Eastern Wallaroo, Common Wallaroo or just Wallaroo on the slopes of the Great Dividing Range that runs for more than 2000 miles (3,000 km) around the eastern and southeastern coast of Australia. 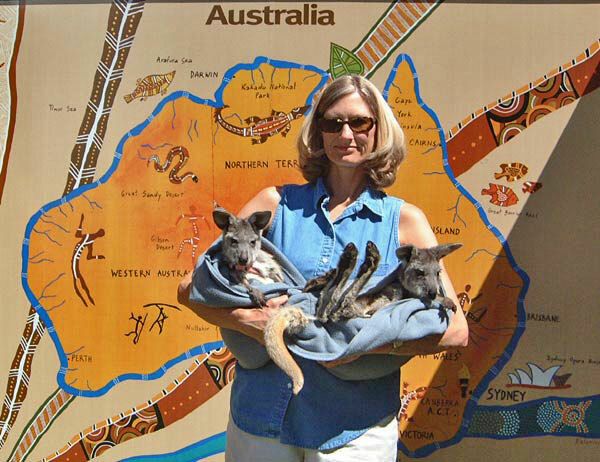 There are four subspecies: the Eastern Wallaroo and the Euro, which are both widespread and two of more restricted range, one from Barrow Island, the other from the Kimberley. 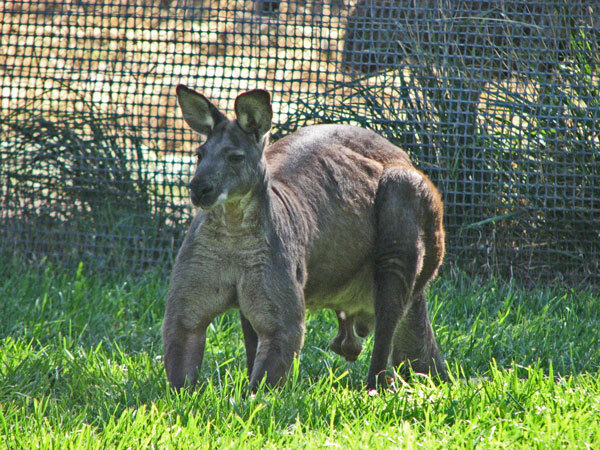 The Black Wallaroo occupies an area of steep, rocky ground in Arnhem Land. 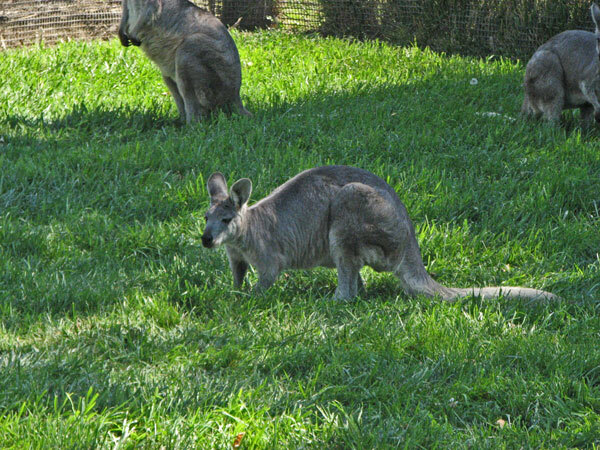 At around 2 to 2 feet (60 to 70 cm) in length (excluding tail), it is the smallest wallaroo and the most heavily built. 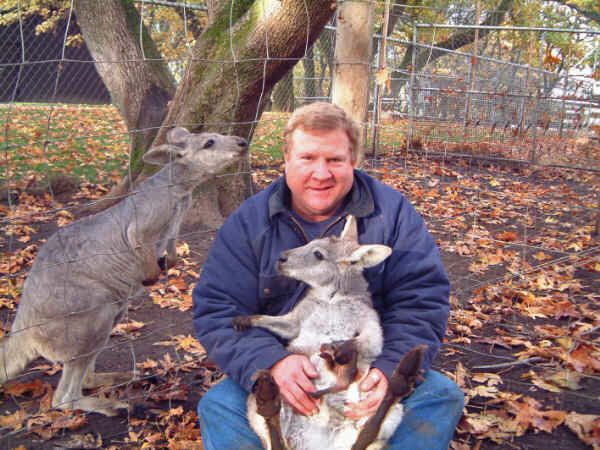 Males weigh 42 to 49 lbs (19 to 22 kg), females about 29 lbs (13 kg). 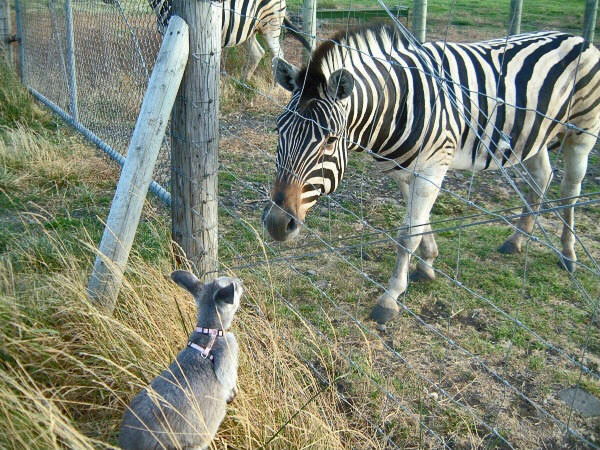 Because it is very wary and is found only in a small area of remote and very rugged country, it is remarkably little known. 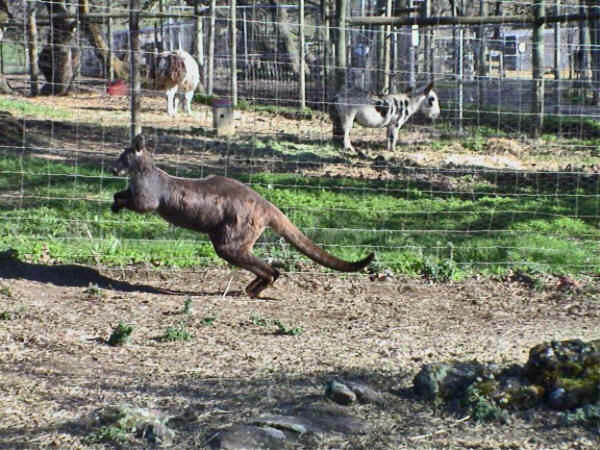 The Antilopine Wallaroo is the exception among wallaroos. 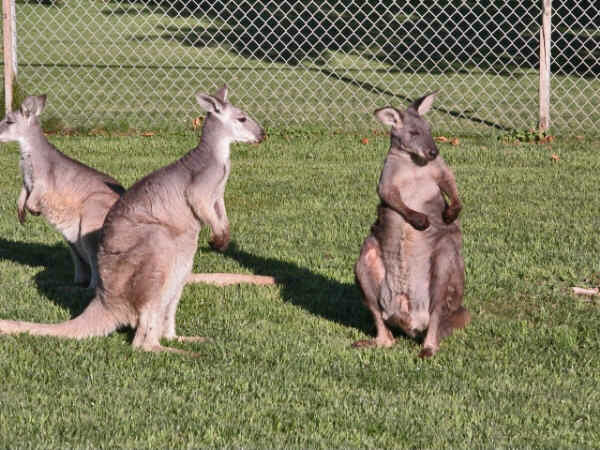 It is, essentially, the far-northern equivalent of the Eastern and Western Grey Kangaroos. 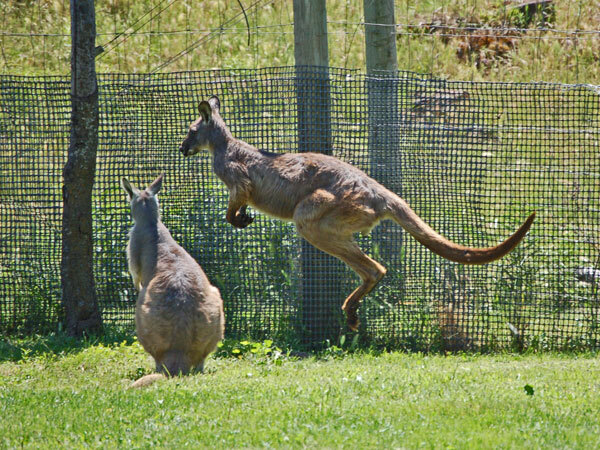 Like them, it is a creature of the grassy plains and woodlands, and gregarious, where the other wallaroos are solitary. 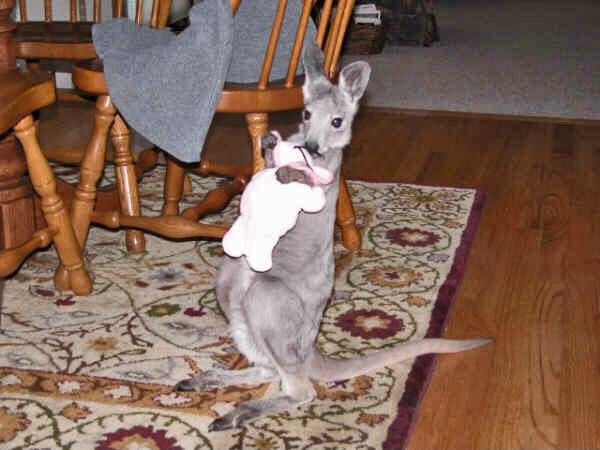 Because of this difference, it is sometimes called the Antilopine Kangaroo. 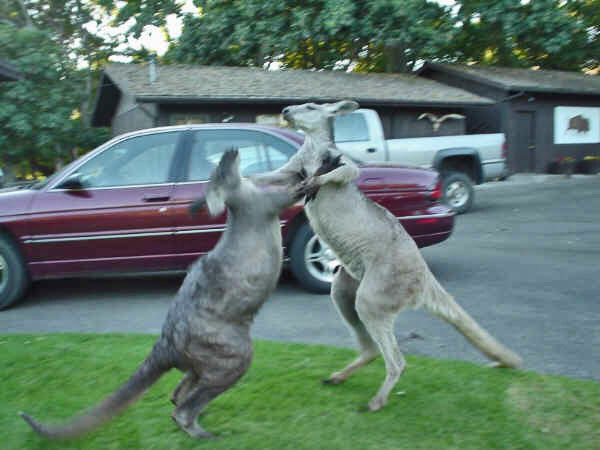 Wallaroos are the most enjoyable, interesting creatures that we have ever raised. 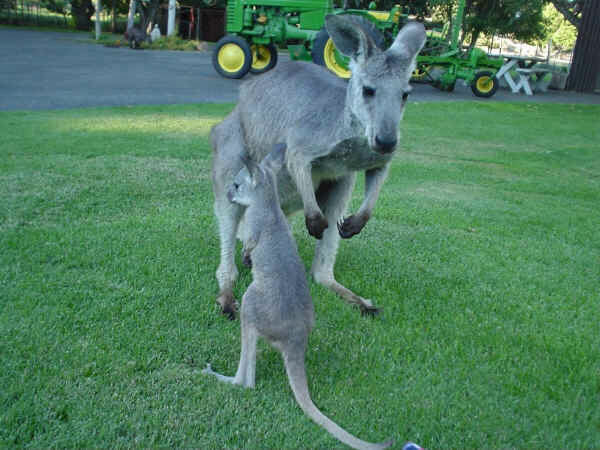 We have owned Wallaroos for about 17 years but just started bottle feeding the babies about 4 years ago. 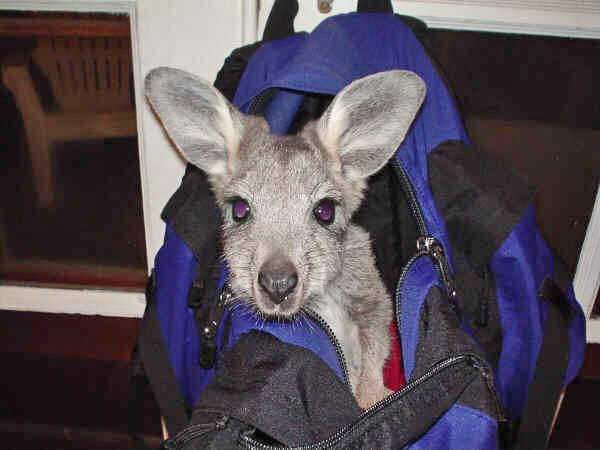 If I had to choose one word to describe a baby Wallaroo, it would be sweet. 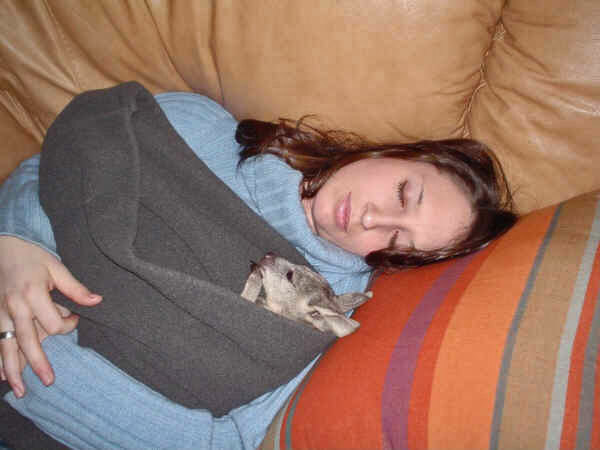 These animals do not have a mean bone in their bodies and love cuddling and living in the pouches that we have made for them. 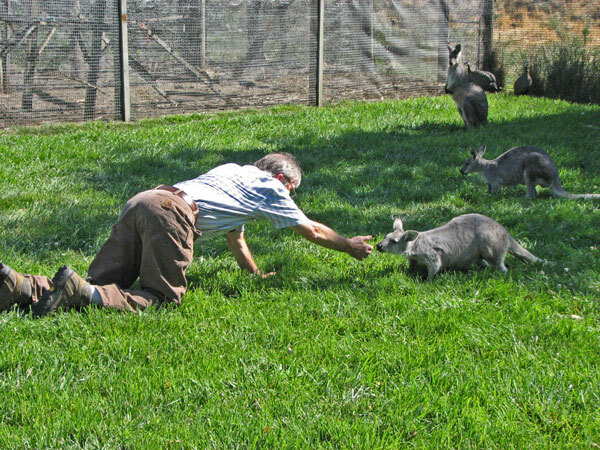 When the baby Wallaroo is pulled from its mother at about 4 to 5 months of age, it will receive a bottle every 2 to 3 hours around the clock. It sounds like a lot of work, but it is very rewarding. 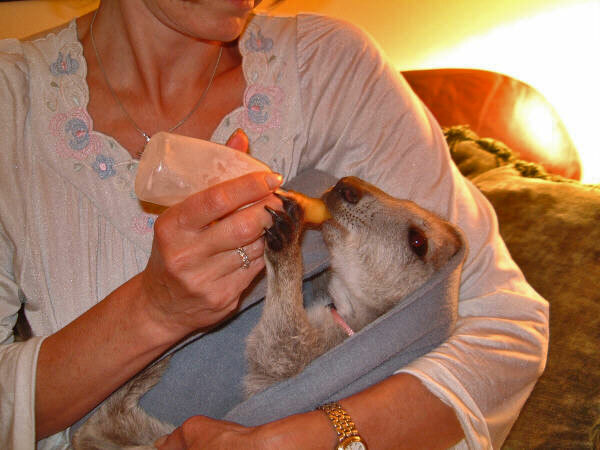 As the baby grows, the frequency of the feedings lengthens until they are weaned completely from the bottle. My babies, Alice and Kylie, are now down to one bottle at bedtime. 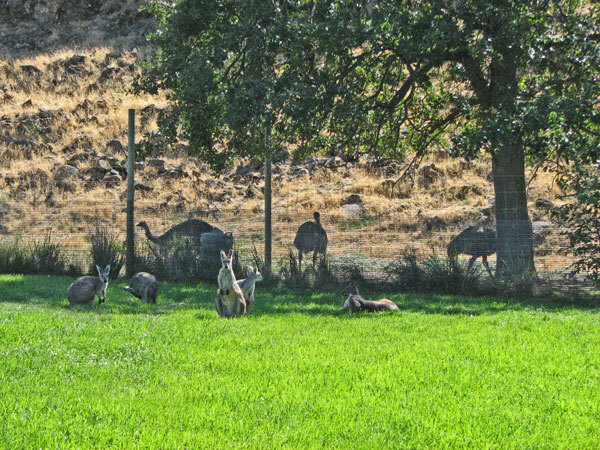 The baby Wallaroos literally stop traffic. Everywhere I go with my baby, I am mobbed. I go to many schools and nursing homes where the smiles generated help lift spirits and brighten days.